Our organization is widely acknowledged in this domain as the leading manufacturer of Cylindrical Wheel. Generate perfectly sized parts in a flash. Cylindrical grinding wheels are used in O.D. plunge grinding and the O.D. grinding of gear shafts, splined shafts etc. Orient Cylindrical wheels are powered with versatile bond system to suit all conditions & find wide application in grinding of Valves , Bearing Races, Cam shaft, Plunger pins, transmission shaft , auto parts etc. Used for grinding the outside diameter of components revolving between two centres. and from 20mm to 150mm in thickness. 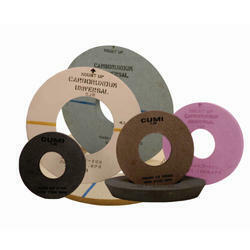 We are the Leading Manufacturers and Suppliers of Cylindrical grinding wheel. Grindwell Norton supplements its existing range of cylindrical wheels with the new Mikron range of wheels.Mikron wheels give you the best results in terms of cutting action and productivity on all O.D.grinding operations. 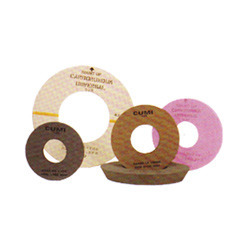 CUMI’s versatile range of Cylindrical Grinding Wheels are used for a variety of grinding operations that require size generation, fine surface finish and fast stock removal. With vast industrial experience, we are involved in offering a wide range of Cylindrical Wheel. Durable in nature, this Cylindrical Grinding Wheels is water proof and based on need of commercial patrons. Moreover to this, these presented Wheels are light in weight and wider in size. Quality checked this Wheels has scratch proof texture. This Wheels has availability in the market in safe form.